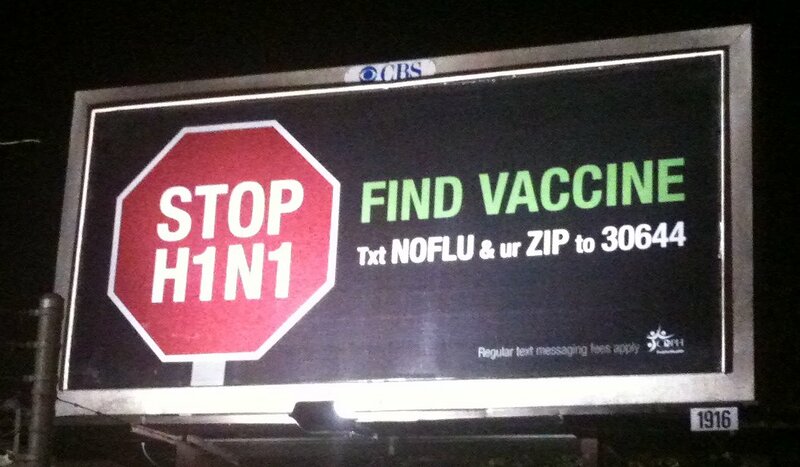 This is a billboard for H1N1 Vaccines that a friend of mine saw and snapped a picture of for me. This is one of the few ads that I’ve ever seen that is written almost entirely in text-speak. It is asking people to send a text message for information, but it’s still not necessary for the request to have been written in text-speak. The problem with text-speak is that it is a short-hand which isn’t used by or understood by everyone. Granted, it’s becoming more and more prevalent every day, but it’s far from universal. I think that I would find text-speak less objectionable if this wasn’t a public service announcement kind of ad. In an ad that’s actually selling a product, I expect a certain level of gimmicky attempts to be “hip”. The problem with putting it in a PSA is that it limits who you reach and with PSAs you want to reach as many people as possible. It might be a small thing, but it can be more important than people realize. My grandmother has a serious problem understanding text-speak, yet she both drives and uses a cell phone. This ad could totally reach her, but I have a feeling that if she saw it she would either be confused or annoyed, which is not the goal. The details are important, especially when they can so affect the accessibility of your ad! This entry was posted on March 23, 2010 at 12:00 pm	and is filed under Health and Science. Tagged: billboard, h1n1, vaccine. You can follow any responses to this entry through the RSS 2.0 feed. You can leave a response, or trackback from your own site.